THE MARTINI CHRONICLES: Martini Thursday...the Scandaltini! Do you know what day it is!? Do you know what day it is!? It's Thursday, October 3, 2013, which means the new season of Scandal begins tonight! By a show of martini glasses, how many of you are as ridiculously excited as I am...I'll wait! 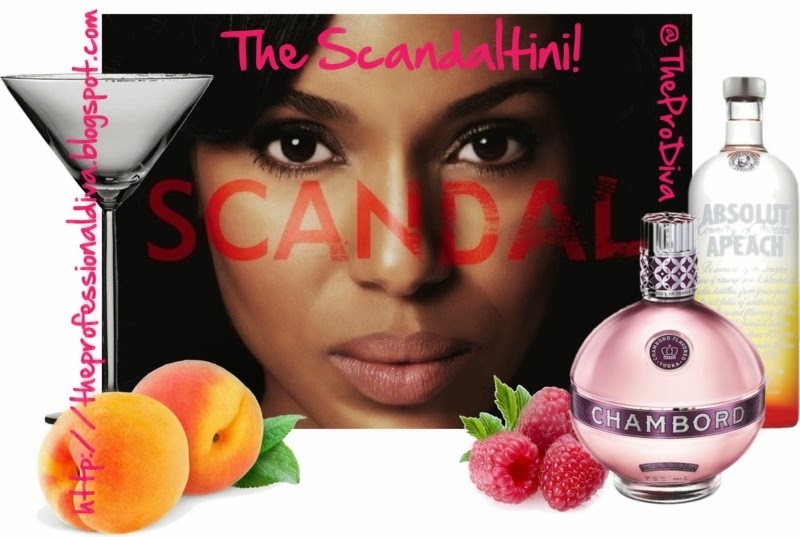 As I began the countdown to Thursday earlier this week, I wondered to myself if my fellow Scandal-watching Divas would be interested in a new martini recipe especially for this evening...I unilaterally concluded that you would! So check out what I like to call the Scandaltini. Is has the perfect mix of sweet and sassy that I'm sure would impress Olivia Pope and her Gladiators. It is also a great addition to you Scandal-watching snack. Try it! 1. In a shaker, combine Peach Vodka, Chambord, Peach Schnapps, Raspberry Lemonade, and Ice. Shake! 2. Drop two or three frozen raspberries in a frosty martini glass. 3. Strain mixture into martini glass. There you have it! Enjoy the Scandal premiere...I know I will! In fact, you can follow me on Twitter (@TheProDiva) and join me for some colorful commentary while watching the premiere. Take care Gladiators! And Drink Responsibly!